3) Take the I train and go to Kivisto. It takes less than two minutes. 4)When you are at Kivisto walk to Keimolanportti bus stop which is near the restaurant and wait for Onnibus. 3) Take the P train and go to Tikkurila. It takes about five minutes. 4) When you are in Tikkurila change to train Helsinki → Tampere. Sometimes it is Helsinki → Rihimaki you can always ask other passengers on the platform, most of finns speak English very well. Leave the bus at Keimola-Vantaa station. You are at Keimola around 20:00. Follow the direction pointed by the green arrow. Go downstairs to a tunnel and turn left. 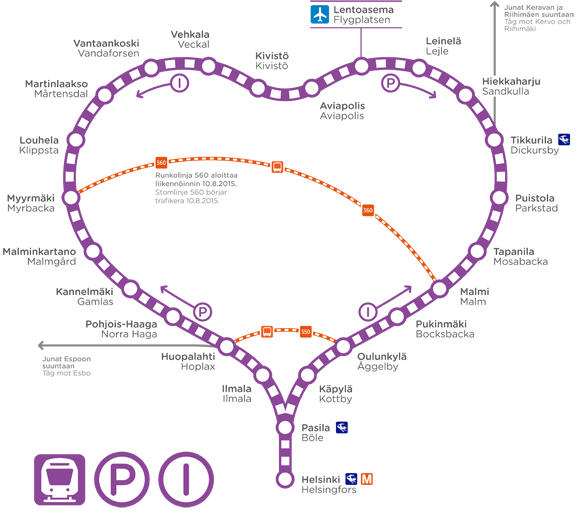 Walk approximately 250 meters to the Kivisto railway station. When you see this stairs go upstrairs (follow the green arrows). The blue arrow is pointing to the Kivisto railway station. Enter the station and go downstairs to the trains. If you are late for this train you can take the next one at 20:25 and still be in time It is a ring road but it will take much more time to reach the airport in opposite direction. Go to the airport (Lentoasema) station - it is the second stop and it takes approximately 10 minutes to be there.